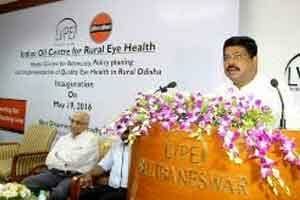 Hyderabad: In a significant development, the Indian Oil Corporation (IOC) had offered an assistance of Rs two crore to L V Prasad Eye Institute (LVPEI), as part of its CSR contribution for setting-up the ‘Indian Oil Centre for Rural Eye Health’ at Bhubaneswar campus. The MOU was signed between Indian Oil Corporation Limited and L V Prasad Eye Institute, Bhubaneswar in March last year. Today, the Centre was inaugurated by Dharmendra Pradhan, Minister of State (Independent Charge), Ministry of Petroleum and Natural Gas. Indian Oil-(LVPEI) Center for Rural Eye Health (CREH) located at LVPEI Bhubaneswar campus is designed to provide solutions to visual impairment in rural Odisha. This Centre will coordinate with secondary and primary eye-care Centres under the LVPEI Community Eye Health and Outreach services. The Community outreach programme extends the traditional individual patient-based clinical practice of Ophthalmology to the assessment and facilitation of good-eye health in the population as a whole. The principle of community eye-health is to apply the knowledge of eye-care to the community to reduce blindness and visual impairment. The Indian Oil CREH will work on collected data from the Secondary Centres to create district-level Quality Eye Care protocols, organised district school screening programme and finally the visual-impairment surveys in a systematic and orchestrated manner. Working in close collaboration with the Government of Odisha and other like-minded eye-care providers in the region, the Indian Oil Centre for Rural Eye Health envisages creating Odisha Vision Atlas that will help in programme planning of quality eye-care in Odisha. The Centre has a team of trained eye-health personnel, including Ophthalmologists and the services will include all common eye diseases. Speaking on the occasion, Taraprasad Das, Vice Chairman, L V Prasad Eye Institute said, eye-care in many parts of India are unavailable, inaccessible and unaffordable to the economically underprivileged, despite the fact that 80 per cent of visual-impairment is avoidable and curable. LVPEI’s pyramid model of eye care demonstrates a comprehensive approach. It not only makes access to eye-care services possible for the vulnerable and needy communities, but also focuses on creating awareness and developing skilled human resources, which is essential to sustainably scale-up eye care services. LVPEI has translated their pyramidal model of eye care delivery in Odisha with the first secondary centre in Rajgangpur, the OCL Eye Care Centre established in 2015. The secondary centre is serving people from western Odisha and the neighbouring Jharkhand . The second secondary centre was established at Rayagada, one of the backward and tribal districts of Odisha. The third one is at Berhampur, which was inaugurated in December, last year. All these secondary centres are aimed to serve the five lakh population of the service delivery areas without compromising the quality and equity. The LVPEI network currently includes a Centre of Excellence at Hyderabad, three tertiary centres in Bhubaneswar, Visakhapatnam and Vijayawada, 15 secondary and 134 primary care-centres that cover the remotest rural areas in Telangana, Andhra Pradesh, Odisha and Karnataka.